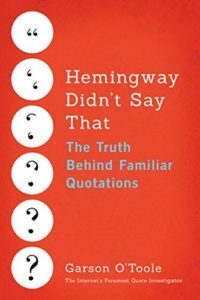 Dear Quotation Investigator: I once read that the funniest book review ever written begins with the sentence: “This book fills a much-needed gap”. Does this book review actually exist? QI: Remarkably, the phrase mentioned does appear in many book reviews and other evaluations. For years writers have been incongruously eager to praise the filling of a “much-needed gap”. The book reviewers probably intend to say: “This book is a much needed gap-filler.” Instead, books are not being praised they are being inadvertently condemned because a much-needed gap should certainly remain unfilled. Typically, the humor is unintentional, but sometimes the writer is aware of the precise meaning of the expression. Besides all this, the horses filled a much-needed gap, and our officers utilized them immediately. There has been no exhaustive book on this subject in this country, and Dr. Hamilton’s system fills a much-needed gap. A much-needed gap among works on the history of art has been filled by the latest book by Mr. Ian Finlay. Dr. G. R. Y. Radcliffe, in the course of The Times’ correspondence suggested that the remedy was in the hands of M.P.s who should refuse to pass legislation which they did not understand. This solution, although certainly the ideal to be aimed at, would probably result in a complete cessation of parliamentary activity if introduced all at once. Thus, although attractive at first sight, it would, it is feared, merely result in ‘the much needed gap’ being filled by further delegated legislation. The author puts the phrase ‘the much needed gap’ in quotes because he or she is aware of its meaning, and would prefer that the gap remain unfilled. Nevertheless, the odd antithetical use of the phrase continues unabated and QI will continue this investigation in the next blog post. Here.